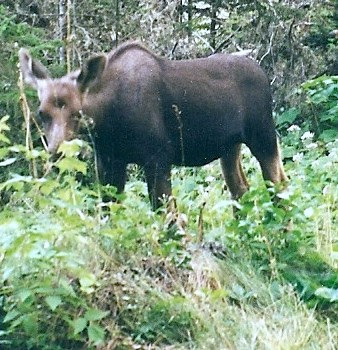 Isle Royale Nation Park in Lake Superior is one of the best places in Michigan to see moose. The 50-mile long island has a rocky shoreline, and off it are other islands to which moose often swim to feed. There are no roads on the island, and it's mostly visited by backpackers and paddlers. Seeing the island via kayak is the best way to explore its coast line. But it's not a trip to be made alone. Groups often travel together. This week and next are the peak season, and trips there are often more pleasant in mid to late August, and even into early September. There are fewer people and bugs. One tip, don't bother the moose. I snapped the picture at left of a female who was eyeing me distrustfully. She had reason. Kids at the campground we were staying at had been bothering her and her calf, and shortly after the picture was taken, she and her young bolted and fled into Lake Superior. You don't want to get caught in front of a charging moose. For more information, go to www.nps.gov/isro/index.htm. A boat from Copper Harbor makes daily trips to the island and another from Houghton/Hancock makes regular trips. There's extensive information about visiting Isle Royale in my book, Michigan: An Explorer's Guide.